This so called short week has felt very, very long. This picture was taken only one week ago, but it feels like a month ago. This is how we get back to business mode. We're all in back to business mode---kids are in school, Tim's work is getting busier and he's staying longer and later, bed times are earlier, etc. "There's a lot more traffic in the mornings now that school is back," I thought out loud the other morning in the car. "Yeah, now that all the kids are in school, the moms and dads are going to the mall," Lucy said. Yep. All us moms and dads are shopping all day long now sweetie. It's funny what a kid's viewpoint of our world looks like. Some times it's right on target, other times not so much. "I need to put on make-up so I can....," I began. "Look younger," offered up Lucy. Ugh. I left myself wide open for kid interpretation. I have to get myself back to business and at the very least finish my own sentences, that I know for sure (this week). I hate when marriages break up. Maybe it's because part of my emotional maturity never got past the year I turned 12 and my parents got divorced. Waaaa. Or maybe it's because I'm mildly obsessed with celebrities and I feel like I know Amy Poehler and Will Arnett. Whatever the reason, I'm sad that they are getting divorced because they seem nice and funny. My kids can drive me crazy, but they are really sweet. I love all the special moments like my oldest boy reading a bedtime story to my youngest boy. This. Is. Love. Zuppa Toscana is the bomb. Yeah, I'm typing about soup. Yeah, that's weird. I usually hate soup unless I have Strep throat. Note I said "usually" because I have fallen in love with a copycat recipe of Olive Garden's Zuppa Toscana soup (another side note: I never go to Olive Garden) (yet another side note: it's gluten free). It's f@*#ing amazing. Click HERE for the recipe. You're welcome. I'm too old to Rock the Vote. For the record, I watched both the Republican and the Democratic Convention. I just thought it was funny that last night even if I wanted to watch the Video Music Awards I couldn't, because I don't even know what channel MTV is. This movie looks good. Check it moms. A movie about strong women and yet another movie filmed in one of the most awesome cities ever, Pittsburgh. 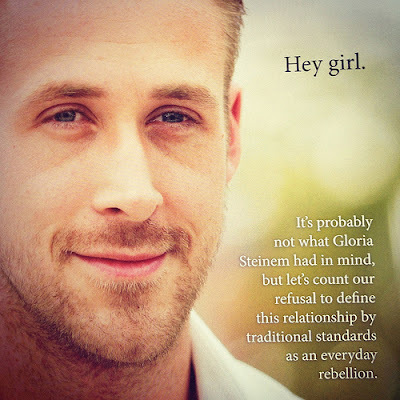 The Ryan Gossling Tumblr turned into a book called: FEMINIST RYAN GOSLING: Feminist Theory (as imagined) from Your Favorite Sensitive Movie Dude is sort of brilliant. Click here to check it out. Tweenparent.com looks like a site I might be visiting quite a lot this year. Some good stuff here. Twitter is seriously my best friend. I may be the parent of a tween but that doesn't mean I don't still act like one. I love Twitter. Come play with me. Follow me here @AngelaYBlood. Facebook is political. Yesterday I wrote a post suggesting we shouldn't unfriend someone on Facebook or unlike a Facebook page just because we don't agree 100 percent on who should be elected president this November. And you better believe, some people unliked me. Waaaa. Help me feel better and like my Facebook page or share it with a friend to like. Click here to help my inner 12-year-old feel more confident and loved. What do you know for sure (this week)? C'mon leave a comment and share what you know.